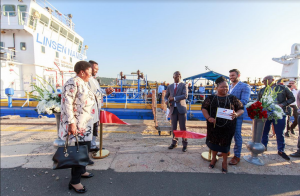 The launch of Linsen Nambi Bunker Services, the first 100% black owned ship-company, kicked off Transport Month and made South African maritime history this week. When Deputy Director General of Transport -Dumisani Ntuli cut the ribbon on Linsen Nambi vessel, Fumana, on October the 1st, he realized the dream and vision of childhood friends, Durand Naidoo and Thuso Mhlambi. The 33-year-old owners of Linsen Nambi, started their company in 2012. 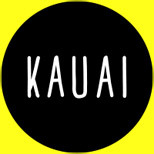 Since then, their fully black youth owned shipping company has recruited highly skilled maritime professionals, developed strong customer relationships and, most significantly, according to Durand Naidoo, “bought and own our own ships”. Transport Deputy Director General Ntuli, a firm supporter of transformation in the maritime industry, believes that South Africa has the potential to grow to a place where this industry contributes to “economic growth and offers opportunities for job creation”. This launch marks yet another Comprehensive Maritime Transport Policy (CMTP) inspired event that seeks to take forth the transformation agenda by ‘transforming and inclusively growing maritime transport economy that leverages South Africa’s Competitive advantage supported by the people and innovative infrastructure and service excellence’. To this end, Government has prioritized the maritime economy through Operation Phakisa. 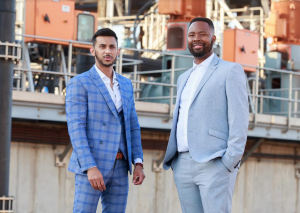 Naidoo and Mhlambi set themselves a goal at the start: to become the leading African shipping company with a global presence. They are on their way to achieving that. Along with WOESA (Women in Oild and Energy SA), they recently purchases a bunker services company from Grindrod. The company currently employs 110 people, a number they hope to increase significantly as they grow their diversified shipping company. Mhlambi says they are proud of their transformation successes: seven out of twelve masters are black, all twelve chief officers and all twelve chief engineers in the company are black. During this 13th anniversary of the October Transport Month, which started in 2005 to raise awareness on the important role of transport in the economy, Government sets out to mobilise public and private sector participation in transport projects aimed at developing the country’s economy and ensuring sustainable job creation. Said Mhlambi: “We are delighted to have launched our company in Transport month. 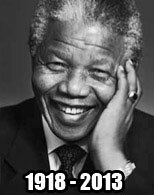 It seems fitting since our vision is in keeping with that of both government and the maritime industry.